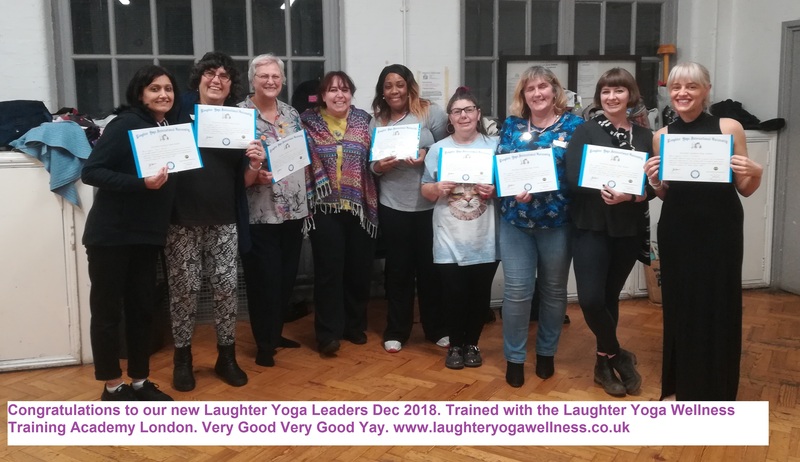 We launched our training academy in 2017 and we have already trained over 50 new laughter yoga leaders.. Word is getting out and we are very quickly becoming the first choice laughter yoga training company here in London with new leaders travelling to train with us from as far as Dubai, Sweden and Oslow too. We are definitley changemakers in the industry, most recently creating a brand new training format that includes the standard laughter yoga training certification. We have added an extra 4 hour advanced training module which we are currently offering here in London and this is in addition to our exclusive support package. We were keen to extend the training and with feedback from our new leaders, we are now offering this new longer training format which went down an absolute treat Nov/Dec 2018 in London. Many of our laughter yoga leaders have already gone on to run workshops in the local community, at festivals and even in businesses . Some of them have added laughter yoga techiques and exercises to their current work, new clubs and classes have opened around the country and more to come soon! One new leader is bringing in some laughter yoga techniques with toastmaster teens and we trained our youngest laughter yoga leader who is running a laughter club at her school and this is just a little taster as the list goes on and on….. Earlier this month Laughter Yoga was featured on BBC’s “Trust me I’m a Doctor” bringing in lots more bookings!! Saturday and Sunday 9th and 10th February 2019 in London Kings Cross. Spaces as always are very limited so please contact me if you would like further info or to book on the course. This 2 day training is fully certificated by Laughter Yoga International and will allow you to gain insurance and teach laughter yoga to groups. This is an extended training that not only includes your full laughter yoga leader certification but a NEW advanced module taking you deeper and further in your laughter yoga practice. You will even run your first class! Spaces will be limited with a maximum of just 8 participants, keeping it real, keeping it small. We favour quality over quantity and supporting you right from the start is top of our agenda. Bookings open now for Feb 9th and 10th and we are excited to have a WEEKEND training option for you. We have had so many enquiries from those working at schools so here we have a School/Teacher friendly training option.